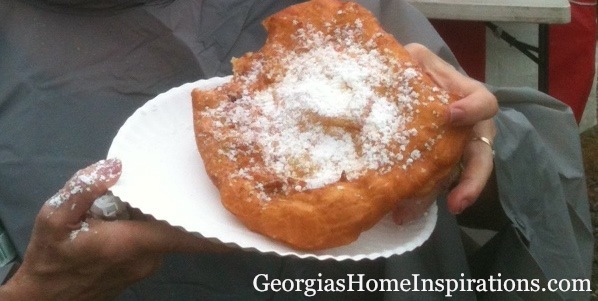 Georgia's Home Inspirations: Fried Dough! So, one of the guilty pleasures of outdoor flea markets and antique shows are the food booths. I have had everything from roasted corn, German bratwurst, and cheese curds to those delicious and aromatic spiced nuts, waffle cones, and fresh squeezed lemonade. But nothing, I mean nothing is as delicious and satisfying as fried dough. You don't see it everywhere and when I came across it at the Brimfield Antique Show, I indulged not once, not twice, but three times! I couldn't help myself. 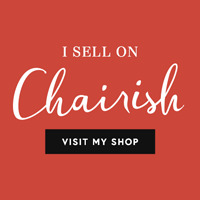 In my defense, I did shop for two full days and expended a lot of energy digging for treasures. Growing up, my mother made fried dough for us and I have made it for my kids. It's essentially a fried bread made from a risen yeast dough. The dough bubbles up when fried and then may be sprinkled with a variety of toppings including powdered sugar, cinnamon, maple syrup, honey and butter. It's super easy and a great way to use leftover dough when making bread, pizza or dinner rolls. If you don't have dough hanging around, pick some up. My local pizzeria sells dough balls for $1! Drop everything and try this; everyone will be hovering around the stove waiting for a hot one! My topping suggestion: melted butter and powdered sugar! Pinch off a piece of dough from the ball. Pull the dough edges to form a flattened shape. Fry the dough over medium heat in enough vegetable oil to cover the bottom of the pan. The dough will bubble up up and turn golden; now flip! Drizzle dough with melted butter. Sprinkle with powdered sugar and serve hot. Yum! ummm.....i want this NOW!!! Looks amazing.